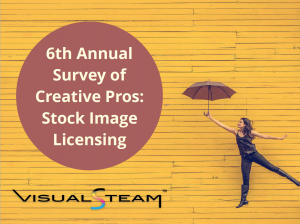 NEW YORK, NEW YORK, USA, February 6, 2019 /EINPresswire.com/ -- VisualSteam1 announces the release of its 6th Annual Survey of Creative Pros: Stock Image Licensing. The survey is sent to more than 20,000 art buyers, art directors, art producers, creative directors, photo editors and marketing professionals around the world. 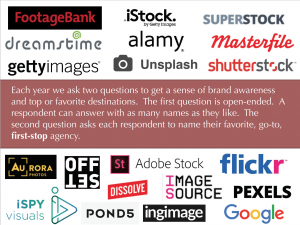 Survey results provide valuable information to creators, licensors and marketing professionals and offer a glimpse into what is driving image licensing today. This year’s report shows a progression but also a continuing change in the market. The importance of visuals to user engagement and retention continues to drive a substantial increase in demand. The volume of images used continues to grow as does social media and communications, in general. Price and budgets impact purchasing in a significant way, as does quality. Once again Getty2 (gettyimages.com) and Shutterstock3 (shutterstock.com) are battling it out for the hearts and minds of Creatives. However, 45% of those surveyed say they are using “free” image content. Free image provider Unsplash (unsplash.com) appears in the top ten of “favorite,” top-of-mind resources. 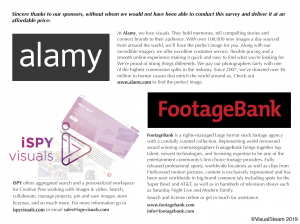 VisualSteam wants to recognize and thank the sponsors of this year’s survey, Alamy (alamy.com), FootageBank (footagebank.com) and iSPY Visuals (ispyvisuals.com). Their support allows us to continue to produce the survey at an affordable price. To request a copy of this year’s survey, please email sales@visualsteam.com. For more information about VisualSteam, please go to www.visualsteam.com, or email info(at)visualsteam(dot)com. VisualSteam (www.visualsteam.com) is a marketing services organization that specializes in digital transformation and visual content markets. We work with producers, creators, and distributors to better understand and respond to market needs and define strategies for expansion and execution. We also work with clients/image consumers and content marketers to help them understand, acquire and manage visual content. Disclaimer: If you have any questions regarding information in this press release please contact the company listed in the press release. Please do not contact EIN Presswire. We will be unable to assist you with your inquiry. EIN Presswire disclaims any content contained in these releases. © 1995-2019 IPD Group, Inc. All Right Reserved.